As its name already suggest it, Mad Mad Monkey has a fun monkey theme with colourful birds and other animals. The game is a 5 reels with 50 paylines video slot powered by NextGen Gaming software provider. 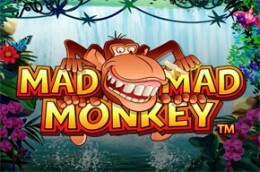 Mad Mad Monkey offers to its players generous free spins feature, multipliers, wild symbols and cash prizes. The big payout (depending on your stake) is up to £90.000. The game is playable from 50p to as much as £10 a spin. The higher value symbols includes a smiling snake, a parrot, a split coconut, and a banana. On the other hand, the lower value symbols are the standard playing cards (10, J, Q, K and A). The wild symbol is represented by a grinning monkey, while the scatter is a Mad Mad Monkey symbol.